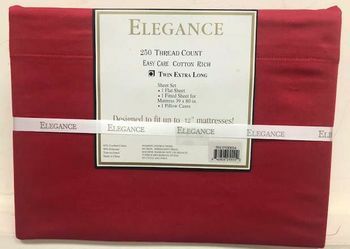 Elegance 250 thread count sheets are cotton rich and available in XL Twin size. Perfect for any dorm room. Sheets are 60% cotton/40% polyester. Sheet set includes: 1 flat sheet, 1 fitted sheet & 1 pillowcase. Designed to fit any mattress up to 12". 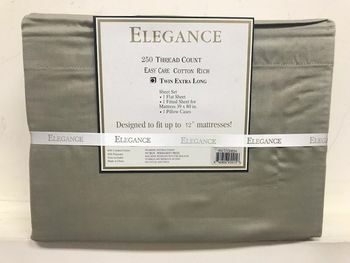 Order your Elegance XL Twin Sheet Sets now right here from our totally secure site. For additional information on XL sheets or any of the other sheet sets or bedding collections currently available here at Laurens Linens, or to place an order by phone, just give call us toll-free at 877-233-2284! Machine wash with cold water. Tumble dry medium. Remove at end of cycle and fold. No iron, permanent press!